How BT&T Refurbishes a Propane Transport? Refurbishing a propane transport is different then refurbishing a propane delivery truck. 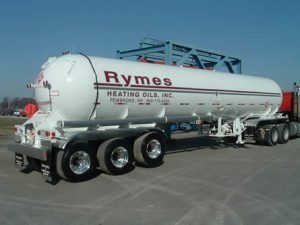 The transport vessel is built of quenched and tempered steel, where the majority of delivery truck vessels are built of non-quenched and tempered steel. In the propane industry they are known as QT and NQT vessels. Although BT&T has built several new transports over the years (and is responsible for some of the new technology used on transports today), they find it best to specialize in refurbishing. There are several transport manufacturers, such as Mississippi Tank and Westmor, that do an excellent job of supplying the new market. The first step in refurbishing a transport is a visual inspection of the unit, beginning with the suspension subframe. The fifth wheel plate is dropped and checked for hidden corrosion in the vessel and subframe. The relief valves openings and wells, if equipped, are checked. Before proceeding any further, BT&T does a Magnetic Particle examination on the interior of the vessel. They need to check the vessel’s integrity before proceeding with any dismantling or repair work. 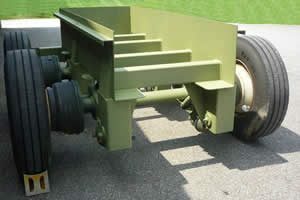 Assuming a positive mag particle test, two lifts are placed under the vessel, one in front of the rear axle subframe and one behind the fifth wheel subframe. The complete unit is lifted and both subframes are cut loose from the vessel pads and discarded. If the axles are salvageable, they are blasted and repaired prior to painting and installing on the new subframe. The complete plumbing system is removed from the vessel, allowing access to all vessel openings for thread chasing and cleaning. The old plumbing will be scraped, except the internal valves and pump which will be taken to the pump and meter department for rebuilding. It is not feasible to rebuilt an old 2” globe and ball valves. The vessel is now ready to be placed in a set of power turning rolls that will allow rotating the vessel 360 degrees. The vessel will remain in the rolls for the next few days while the new subframes are built, and the pads are cleaned and sanded in preparation for the new subframes and other attachments that are being built. This job can only be accomplished by a lot of hard grinding and sanding. The turning rolls make this job much easier and safer. While in the turning rolls, all threaded studs will be removed from all flanged openings and replaced with new cadmium studs. The vessel is now leveled from side to side, using the turning rolls. Two jacks are used to raise the vessel for installing the suspension and fifth wheel subframes. When the welding is completed on the subframes and all attachments are ready the new trailer dollies will be installed, if needed. The two support jacks will be removed and the unit will be completely plumbed using the rebuilt pump and internal valves. New stainless steel brackets, clips and other equipment needed for the air and electric cable are also installed. 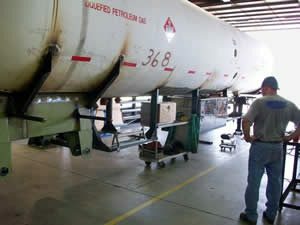 Any attachment that requires welding, such as fender and mud flap brackets, will be placed on the vessel prior to final sand blasting. The vessel is moved to the hydro lot where it will be filled with fresh water and pressure tested. After pressure testing, the water is drained out and the interior of the vessel is checked for any debris that might have entered the vessel during the rebuilding process. The interior of the tank is allowed to dry prior to placing the manway cover back on the unit using a new gasket and bolts. The unit is now moved to the sandblaster where the exterior, including all plumbing, subframes, and all attachments will be sandblasted. The unit is now taken to the paint department where the vessel and all equipment will receive one coat of etching primer, one coat of filler primer and two coats of Imron paint in the color selected by the customer. The unit is now ready for final assembly where new fenders, light boxes, air and electrical control systems will be installed back on the provided brackets. Final assembly is about a two-day process. The unit is now turned over to the outside crew who will pressurize and purge the vessel and do a complete leak check. If the unit is equipped with a meter it will be tested and proved at this time. 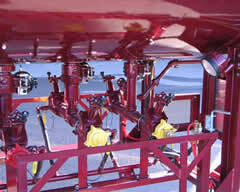 While coupled to the yard tractor, all lighting, brake and control systems will be checked for proper operation. The complete unit is washed and now ready for customer pick up.